Did you guys notice my profile picture? I mean MY actual picture and NOT a picture of a cupcake. I think I might have been one of the last people in the world that didn't have a Facebook account and I finally signed up this past February. Then, someone told me that I really needed to update my profile to show a picture of myself. People need pictures in order to connect with you and no one can relate to an "avatar" icon. A few months went by while I contemplated this. That was my next step, but did I really want my picture out on the internet for everyone to see? Then, I finally realized . . . who cares? Everyone's pictures are out there for the whole world to see, what is the big deal? Now, onto the Coffee Cake. It turned out yummy. The cake is very heavy and dense and it's loaded with eggnog flavor, not only because of the eggnog (duh), but from the nutmeg and rum extract too. The best part is that you prepare the cake batter the night before and keep in the fridge overnight. That way, when your kids (or DAD if you are in my family) wake you up super EARLY Christmas morning and you are still half asleep, you don't have to worry about missing some ingredients. All you have to do is preheat the oven and bake the already prepared cake! Grease a 9x13-inch rectangle pan; set aside Cream together sugar and butter until light and fluffy. Add the eggnog, sour cream, rum extract and eggs and beat until well incorporated. Mix in the flour, baking powder, baking soda and salt until blended. Spread evenly in prepared pan. In a small bowl, combine the streusel topping ingredients and mix with a fork until crumbly (I used my hands). Sprinkle streusel topping over batter. Cover and refrigerate at least 8 hours. Heat oven to 350 degrees. Uncover pan and bake 35-40 minutes or until a toothpick inserted in the center comes out clean. 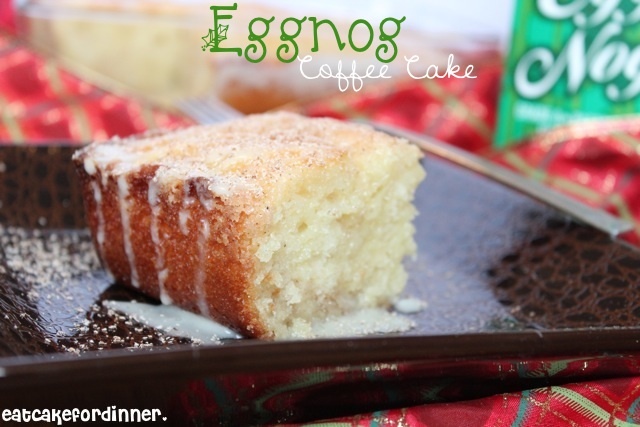 Cool 20 minutes and top with eggnog glaze. In a small bowl, mix powdered sugar and eggnog until smooth and thin enough to drizzle. Drizzle over coffee cake. Jenn's Notes: I cut the above recipe in half and baked in a 8x6-inch pan. I used non-fat yogurt instead of sour cream and I made the full eggnog glaze recipe for the 1/2 batch, because I like lots of glaze. The only thing I would do different next time, is to add the streusel topping in the morning, right before I bake it, because the sugar dissolved overnight and didn't end up being crunchy. I would prefer it to be crunchy, but that is just my personal taste. Nice see you in person ;). I did the same recently, after 3 1/2 years with no photo on my blog. It was a little scary at first, but now I wonder why I waited so long. Happy blogging!! This sounds so yummy! I have been wanting to try an eggnog recipe for a while. This would be perfect for Christmas morning! Thanks! I have been experimenting with some eggnog cakes. I will pin and try yours. I did make one without a topping and we put french vanilla ice cream on it with butterscotch caramel sauce.